After a week of indulging, eating out and general grazing throughout the days (despite losing 5lb! 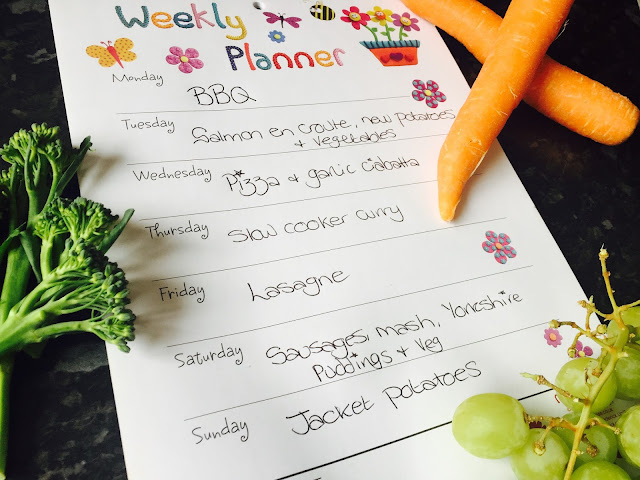 )I've decided to start sharing our meal planner again. I always schedule dinners in when I do the shopping, to prevent food waste, and I like to know what other families are enjoying too so hopefully I can find some inspiration while possibly inspiring others in the process. I have some BBQ food left over from the weekend as I went a bit meat mad as usual so that is on the menu tonight. This consists of cheddar steak burgers, chicken wings, lamb kebabs along with some salad and coleslaw. Tuesday and Wednesday the Mr and I are child-free so the pizza is a quick meal before we go out and the salmon will be smeared with pesto before going into some puff pastry - delicious. Thursday is a family favourite and as the weather is meant to worsen it will be ideal to warm us up a little. I have some mince in the freezer that didn't get used recently so that will make a few lasagnes in my new dishes and I also have some sausages and potatoes that need using up for Saturday. We have a busy evening on Sunday due to something rather exciting happening (all will be revealed shortly!) so the jacket potatoes are quick and easy to serve for convenience.